The Sunday 1:00 pm Mass was the farewell Mass for the community of San Francisco de Sales and Fr. Mario Contreras allowed the participants to venerate the Icon after the Mass. 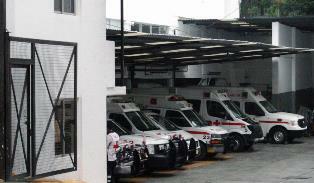 Our Lady left at 2:40 pm for the facilities of the Red Cross in a colony in Mexico City known as Polanco, where the Convent of the Apostolic Sisters of San Juan and Medical Service of Mexican Red Cross is situated. The Pilgrim Icon of Our Lady of Czestochowa stayed here from March 15 to 21. Our Lady was greeted by Sister Amanda, belonging to the community of Christ the King Priory of the Apostolic Sisters of San Juan. The Sister led the guest from the entrance to the residence of the religious located within the Red Cross, on the 3rd floor. 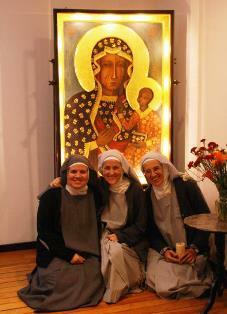 This entire community is composed of five sisters and one postulant. The superior is from Mauritius, there is one Mexican sister, 3 French sisters, and the candidate comes from Colombia. In the section of the building designate as a convent, there is a small chapel, where the 6 nuns met for prays. 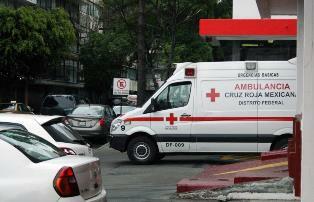 Their lives are totally dedicated to serving the sick and injured who come to the Red Cross. This chapel is open to the public, so relatives of patients, doctors and nurses who wish to pray are welcomed. During the week they stopped in between their duties to pay respects to the Mother of the Savior. 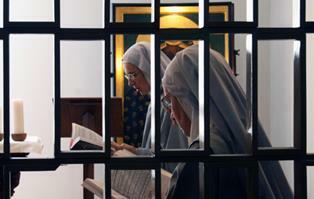 The Apostolic Sisters of San Juan are a contemplative and active community. Their apostolate begins with the sign of their consecrated life to prayer, intellectual and manual work, and consequently the apostolate to the needy. The founder is father Dominique Philippe who devoted his life to the pursuit of truth, saying that God is love through a deep love for the Eucharist. He died on August 26, 2006 at the age of 93 years. Thursday March 19, the date on which the Catholic Church remembers St. Joseph, Spouse of Virgin Mary and foster father of our Lord, coincided with the visit of a priest of the order of the same family of San Juan serving in the Parish of Risen Christ and Our Lady of Lourdes (French parish) which is two blocks from the hospital. The priest celebrated Mass and later did the consecration of the pilgrimage to St. Joseph facing the sacred image of Czestochowa. The Medical Director of the Medical Service of the Red Cross is of Polish descent. Dr. Stanislao Casimiro Stanislawski Mileant, was very pleased with this special visit. The image of Jesus of Divine Mercy, accompanying the Sacred Icon of Czestochowa, visited different departments of the hospital, such as: Emergency Room, Intensive Care and Trauma, giving hope and strength to all the patients. Moreover, this was a way of inviting hundreds of relatives and patients to meet and salute the Black Madonna in the convent chapel.